UMP | University of Minnesota Press Blog: How the Philippine government propagates a model of "labor brokerage," even in a time of global economic crisis. How the Philippine government propagates a model of "labor brokerage," even in a time of global economic crisis. Robyn Magalit Rodriguez is assistant professor of sociology at Rutgers University. 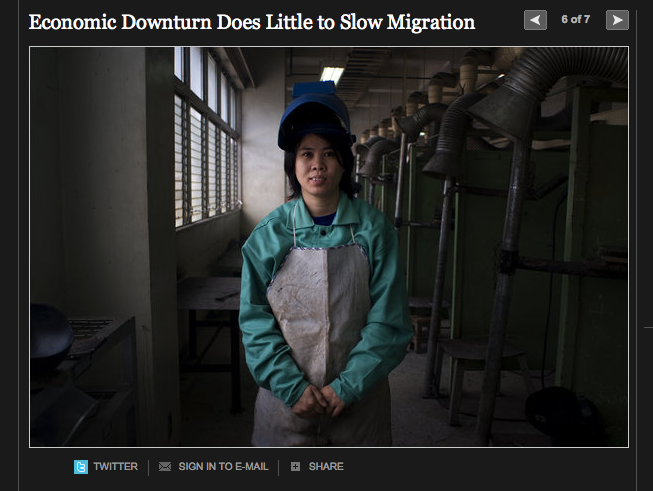 She is author of Migrants for Export: How the Philippine State Brokers Labor to the World. Despite an unprecedented global economic crisis, Filipinos are leaving the Philippines in the thousands for employment in hundreds of countries overseas. It seems rather paradoxical; how is it possible for people from the Philippines to migrate during a period of crisis? First, labor demand in labor-receiving countries persists. Indeed, long before the recent crisis, immigrant-receiving countries like the United States had been experiencing a major reorganization of employment relations, giving rise to what former American Sociological Association President Arne Kalleberg calls “precarious work.” He defines this as “employment that is uncertain, unpredictable, and risky from the point of view of the worker” (p. 2 in 2009, “Precarious Work, Insecure Workers: Employment Relations in Transition,” American Sociological Review, Vol. 74, p. 1-22). On one hand, it can be argued that migrants have always been confined to “precarious work.” On the other hand, more contemporary forms of employment precariousness are also creating new demands for migrant workers, including migrants from the Philippines. Migrants, Kalleberg argues, “are more willing than other workers to work for lower and to put up with poorer working conditions.” As the economic crisis deepens, it can only be expected that employers will continue to restructure work relations to further precarious employment conditions and if American workers continue to resist taking on these jobs, immigration will persist. The Philippines supplies at least one-fifth of the world's seafarers. Find out more in this New York Times slideshow. The expansion of precarious work, however, is a global phenomenon that also afflicts developing countries. In their bid to attract global capital, developing states have dramatically restructured employment relations in ways that generally favor employers and not workers. Employment precariousness creates social pressures in these countries, including increasingly restive social movements that demand better wages and working conditions, among other things. Rather than addressing these concerns, some development countries have turned to the export of labor—the second major reason for global migration during this period of global economic crisis. The Philippine government, as the article correctly points out, has perfected a strategy of what I call in my book “labor brokerage.” It has created a vast, highly rational bureaucratic process that mobilizes migrants for export. Though many would choose otherwise, Philippine citizens are opting to leave their families behind and work overseas. While the world was reeling from the blows of the onset of the crisis in late 2008, the Philippine government hosted the recently formed Global Forum on Migration and Development (GFMD) and it was there where states, both labor-sending and labor-receiving, propagated the Philippine “model” of labor brokerage. Indeed, “guest worker” programs are being touted more and more by governments around the world as a means of addressing immigration “problems,” especially as increasing unemployment makes precarious forms of work more desirable to native workers than they used to be. Interestingly, the next GFMD meeting is being hosted by the Mexican government this year, while the Mexican state, it seems, is attempting to address its emigration “problems” by promoting mechanisms by which its citizens can leave the country through the legal channels that guest worker programs promise. Yet if the Philippines is a “model” it is ultimately a “model” of what one critic calls “legalized human trafficking.” Workers in the Philippines, even when covered by employment contracts and other laws that the Philippine government has introduced supposedly to protect workers, find themselves going from conditions of employment precarity in the Philippines only to be inserted into precarious employment conditions elsewhere in the world. To make things worse, their status as non-citizens makes them all the more vulnerable to exploitation. Even when they are “legal” workers, employers’ interests for cheap and docile workers trumps workers’ entitlement to just terms of employment. Read more about this topic in Migrants for Export.